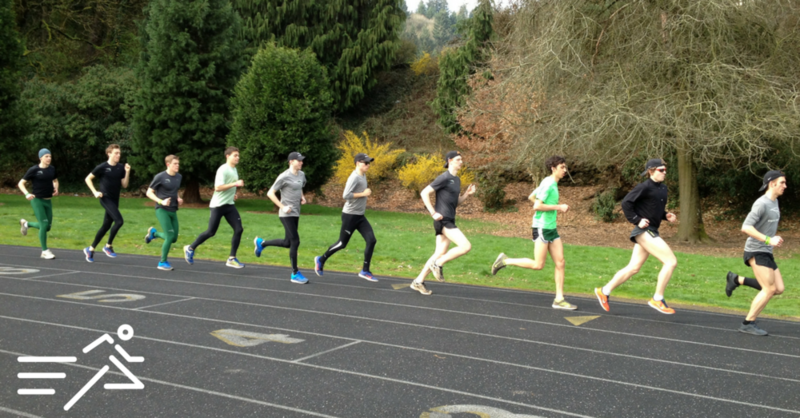 Jake (2nd from left), John (6th from left) and Neil (far right) run with fellow members of the 2014 Portland State University "Long Green Line." Recovery: 200m jog after each rep in 60"
The 5K is a tough event to train for and race. The 5,000m runner needs a comprehensive blend of strength, stamina, and speed. They must run the redline for 10 - 12 minutes, accelerate, and then be able to sprint the final lap. The athlete must tolerate increasing degrees of physiological difficulty throughout the event, yet be coherent enough to race. Steve and I dedicated an entire podcast recently to it. As championship season nears, designing a session to address these demands, but without overly fatiguing the athlete, can be tricky. This workout attempts to bridge the gap. The 600m reps are performed at goal 5K pace. For Jake, John, Neil, all about 15:20 guys at Portland State University back then, this is roughly 73/400m effort. The 200m rep is performed at roughly 800m pace (which was about 1:58 for these guys). Here the aim is to sustain a pulsation between running 5K goal pace and then accelerating to an 800m rhythm with incomplete recovery of 200m in 60". The 3rd and 4th rep are honest, but not overly taxing. It takes discipline and focus to meet the demand on the 200m reps as the legs and mind are tiring. The goal of the session to run the 200m rep at 800m speed as fast or slightly faster than asked when a little tired, as this will be what the athlete will face the final 400m of the 5K. When run to success, the athlete can walk away from this session feeling accomplished, conviction, but not toast. I like to place it on a Tuesday or Wednesday in between a Friday/Saturday weekend racing calendar. That way the athlete gets about 3 days easy after the last race and 3 days of easy running before the next race. The purpose is to teach the ability to be able to "change gears" to a faster turnover when somewhat but not overly fatigued so the athlete can 1) practice the skill 2) increase confidence 3) familiarize themselves ever so slightly to the "sting" of 5K racing. It may not be fancy, but it works. It proved Jake, John, and Neil's ability that season to consistently find another gear in the final stages of races when it mattered.